With the Yulong River winding through town, Baisha town, with a history of nearly 1,000 years, offers natural landscape and the largest rural market in Guilin/Yangshuo Area for you to explore. The town is located approximately 60 kilometers from Guilin City. In addition to the town and attractions within its vicinity, Baisha Rural Market Day is held on days ending in 1, 4 and 7 of each month (except for the 31st where this applies). For example, the 11, 24th & 7th of each month (as well as other dates) host the Baisha Rural Market Day where farmer's sell their various produce - this is not a touristic marketplace! Using the natural advantage, the government of Baisha Town has built a quiet park offering visitors to Yangshuo a chance to enjoy the amazing landscape and the ethnic minority customs. It is called Shangri-la Park (世外桃源). In the park, visitors can appreciate the Tianqin Performance done by the Black-Clothes Zhuang People, dancing performance done by Miao People, Zhuang brocade, Dong Chorus without any accompaniment originate and wax printing of Gejia People. If you are interested in old culture, Jiuxian Village is an ideal place for you. Originally built in AD 621, Jiuxian is situated close to the ruins of the ancient town of Guiyi County. Most of the buildings here are typical of Qing Dynasty style with exquisite painted beams and carving pillars. 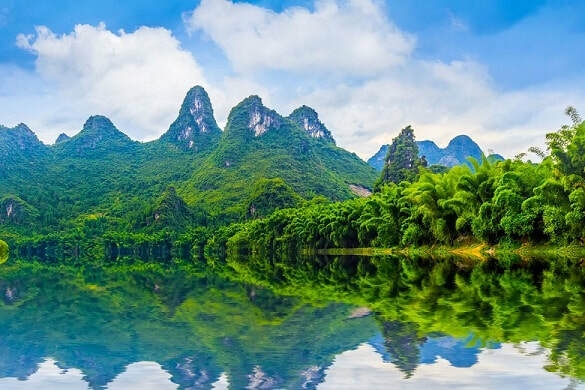 If you’re planning to visit Baisha Town for photography purposes or want to explore or experience the farming activities in the Yangshuo countryside, the best time is from the mid-April to early May or from the end July to the early August. From mid-April to early May, you will see many locals growing rice in the fields. If interested, you can join them. From the end July to the early August, rice has turned yellow and ripe and you also can see many villagers harvesting rice by hand. If interested, you also can experience the farming activity with them together. Yellow rice in the fields create a stunning view ideal for photography. If you want to explore local daily life of farmers in Yangshuo? You can visit Baisha Rural Market on its market day - the dates end with the number of “1”, “4” and “7” except the date of 31st. The best months for photography are usually from April until October. Rent a vehicle departing from either Guilin or Yangshuo. This is the quickest and most direct option. Take a bus (not direct bus) from Guilin (the small square in front of Guilin Railway Station) to Yangshuo. Let the driver know that you will be getting off in Baisha Town. It takes around 70 minutes drive from Guilin to the town. ​As Baisha Town is located around 9 kilometers from Yangshuo County, riding a bike to the town from Yanghsuo is also great. You can rent a bicycle and cycle along the backroads to the town. Please remember to take a map with you! If you want to pick kumquats or Shatian pomelo in local farmers’ orchards in winter, please wear warm clothes and take an umbrella with you as it is sometimes rainy in Guilin Area in winter. If you would like to explore the local rural market, please visit it on the date which ends at the number of “1”, “4” and “7” except the 31st. If you demand high quality food and a very quiet surrounding for dining, please bring enough food with you when visiting the local rural market or even the town. Please take good care of your valuables when visiting the local rural market. Interested in visiting Baisha Town on a Tour? Wendy Wei Tours offers a variety of different packaged tours as well as custom tours including Baisha Town, among other attractions and destinations. To find out more, please visit our Tours page or Contact Us directly to find out more.